D. Pissarenko. Eigenface-based facial recognition. 2003. L. Sirovich and M. Kirby. Low-dimensional procedure for the characterization of human faces. Journal of the Optical Society of America A. 1987, 4 (3): 519–524. doi:10.1364/JOSAA.4.000519. M. Kirby and L. Sirovich. Application of the Karhunen-Loeve procedure for the characterization of human faces. IEEE Transactions on Pattern analysis and Machine Intelligence. 1990, 12 (1): 103–108. doi:10.1109/34.41390. M. Turk and A. Pentland. 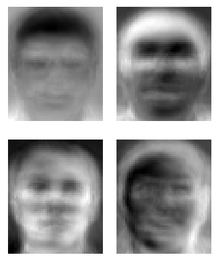 Face recognition using eigenfaces (PDF). Proc. IEEE Conference on Computer Vision and Pattern Recognition: 586–591. 1991. M. Turk and A. Pentland. Eigenfaces for recognition (PDF). Journal of Cognitive Neuroscience. 1991, 3 (1): 71–86. doi:10.1162/jocn.1991.3.1.71. A. Pentland, B. Moghaddam, T. Starner, O. Oliyide, and M. Turk. (1993). "View-based and modular Eigenspaces for face recognition". Technical Report 245, M.I.T Media Lab. T. Heseltine, N. Pears, J. Austin, Z. Chen (2003). "Face Recognition: A Comparison of Appearance-Based Approaches". Proc. VIIth Digital Image Computing: Techniques and Applications, vol 1. 59-68.